HAMILTON - Dave McNair Campbell, 66, died unexpectedly on March 25, 2019. Born in Denver, Colorado, Dave grew up camping, hunting, fishing, and skiing. He was 12 when he met a wilderness ranger on a family camping trip and knew immediately this was the career for him. He began working seasonally for the Forest Service while still in college at Colorado State University. Forty years later, Dave retired from what he always said was the best job in the Forest Service: District Ranger on the sprawling West Fork District. He relished the challenges of managing the vast wilderness. In retirement, Dave continued the work he had begun with the Forest Service International Programs, making more than ten trips to Africa to share his wisdom with local agencies on land management issues. Beginning nearly five years ago, Dave found an even more satisfying job, as the fun grandpa. He loved nothing more than sharing the outdoors with his three grandsons, making up science puzzles and games out of leaves, icicles, and rocks. Liam, Brooklyn, and Benjamin have lost a very special presence in their young lives. Dave married Sharon O’Hare in 1981. They later divorced after having two remarkable children, Kate and Colin. Dave cherished sharing with his children his love of the outdoors. He loved everything about being a dad: Friday outings to fish mountain lakes with little Katie, coaching Colin’s soccer team, playing guitar and singing in church with Kate, teaching Colin to ski with tiger turns. He was more proud of the incredible, competent, and compassionate adults Kate and Colin became, and the wonderful families they created, than any of his own accomplishments. In 1999, Dave met Anita Poe and they joyfully celebrated their marriage in 2002 at Lake Como. Dave and Anita shared a charmed 17 years of marriage together, traveling to Scotland, South America, Africa, Australia, Nepal, Madagascar – coming home to their piece of heaven on Judd Creek in Hamilton. They loved taking their camper to dispersed sites in the National Forest, floating the Bitterroot and West Fork, skiing at Lost Trail, and just watching the sun go down over Ward Mountain. As an added benefit, Dave became the beloved step-father to Andrea and Dylan Brown. With Anita’s retirement at the end of 2018, things were just about perfect, and they were looking forward to many more adventures, including both Colin’s and Andrea’s weddings, before Dave’s untimely death. Dave could make a friend of anyone, and his friendships lasted for life. He was a musician who cherished his Martin guitar and never tired of corny old folk songs. He was a man of unwavering values and faith with a heart so big and grateful that he couldn’t say grace without tearing up. 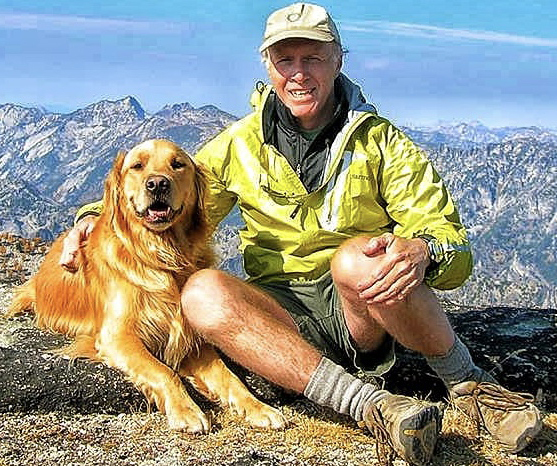 He was passionate about wilderness, and a fierce advocate for public lands. He was respected for his leadership in the evolving area of wildfire management. He loved to laugh and lived his values every day. The world is a better place for him being in it, and a sadder place without him. Dave is survived by his wife, Anita Poe; daughters, Kate Telis (Alex) and Andrea Brown (Michael); sons, Colin Campbell (Heidi) and Dylan Brown (Lindsay); three grandchildren; brothers, Jim and Charlie Campbell; sister, Adele; and beloved nieces and nephews. In lieu of flowers, the family suggests donations to Bitterroot Trout Unlimited, the Selway-Bitterroot Foundation, the Bitterroot Water Forum, or another conservation group. A Celebration of Life will be held for Dave on Saturday, March 30th at 2pm at Daly Leach Memorial Chapel, 1010 West Main Street, Hamilton, MT 59840. Condolences may be left for the family at www.dalyleachchapel.com.